Tokyo, 2005 ~ By the time I landed at Narita International Airport, I knew that something was wrong. I felt sick, and this was very annoying, because I almost never get sick. In fact, people can usually count on me to “jump in” at the last minute to sing for sick colleagues. But sinus headaches are my Achilles’ heel. Just before the plane took off, I had sensed a familiar throbbing between the eyes. Then after thirteen hours of breathing airplane air, I was congested and my throat felt raw. What a great way to start my first Japanese concert tour! 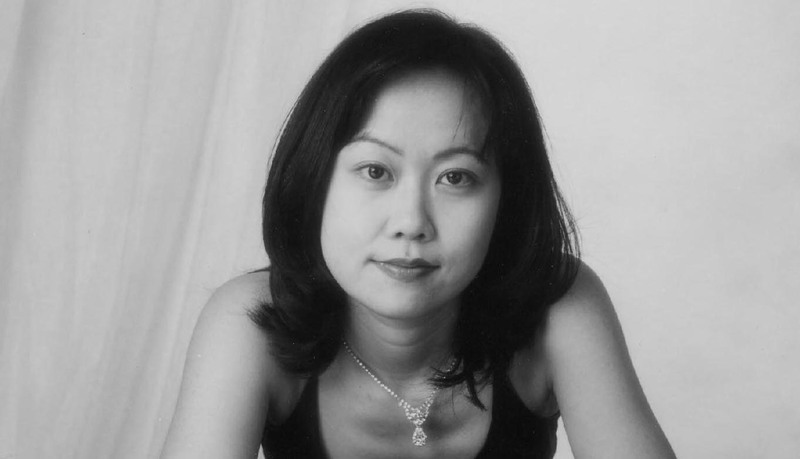 My friend and pianist, Ayako Watanabe, met me at the airport. She had planned the details of our tour. We were scheduled to perform eight concerts in twenty days. 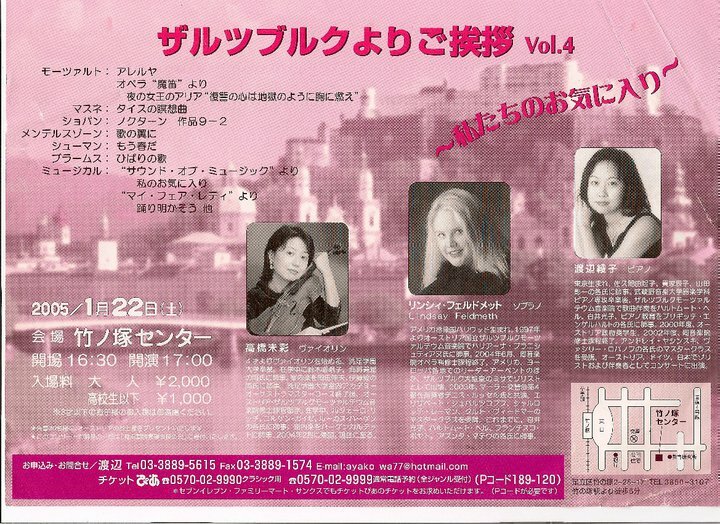 I’ve mentioned Ayako before, but this was long before we ever performed in Moscow, Los Angeles, and Kathmandu together. 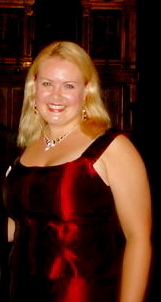 Back in 2005, we had only recently graduated from the Mozarteum, and we had just given a series of Liederabende (art song recitals) in Salzburg and Vienna. 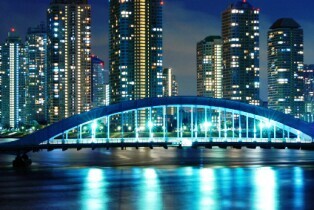 Now we wanted to “take our show on the road” and perform in Tokyo, Ayako’s hometown! She took me straight to the doctor. As soon as we got there, she filled out my paperwork for me; people smiled when they heard us chatting in German. We took off our shoes before we sat down in the waiting room. I stuffed my big American feet into dainty little plastic slippers. “What’s my last name then? Is it still Feldmeth?” I asked. The doctor gave me a combination of herbs and medicines and told me to take it easy. By the next day, I felt much better, but I was still a little weak. Right before our first concert, I found a quiet spot backstage where I could lie down. I rested there for a few minutes. When I opened my eyes, I saw an older gentleman looking down at me with a worried expression. “¿Tienes fiebre?” he asked. I decided that I must be delirious because it sounded like this nice Japanese man was speaking Spanish to me! “Me duele la cabeza,” I told him. My Spanish isn’t great, but it’s much better than my Japanese. Later, Ayako explained that the owner of the concert hall was an excellent musician, himself, and that he had studied music in Spain. Then it all made sense. My name was Rinjii and I was speaking Spanish in Tokyo. Stranger things have happened, right? And I was still singing Mozart and Strauss. So at least that was familiar! Once I got my strength back, I started to really have fun in Japan. Ayako is a fantastic tour guide. I ate sushi. I got fitted for a kimono. I went on a river cruise. I saw Mount Fuji. I experienced the Chinatown in Yokohama. On a cold night in Kyoto, I even saw a geisha hurrying along the road. One morning, we woke up to discover that it was snowing in Kyoto! The famous temple gardens were now frosted with snowflakes. It was dazzling. I have pictures, but they don’t do it justice. The scenes I tried to photograph were large and bright, so Ayako and I look like tiny black smudges against a pretty white world. But I still consider this once of the most beautiful things I’ve ever seen in my life: a Japanese flower garden dusted with fresh fallen snow. And of course, we had our music. Everywhere we went, our audiences were very warm and appreciative. We sang in some amazing venues and we felt humbled to receive several standing ovations. We even got to do some concerts with the Japanese violinist, Misai Takahashi. It was an unforgettable tour. But as soon as I got home to Austria, I made an appointment with a famous otolaryngologist. I just wanted to be sure I hadn’t damaged my voice by singing that first concert when I was ill. So I went to the doctor trusted by all of the singers at the Vienna State Opera, Dr. Reinhard Kürsten. The truth is that you can still sing when you have a slight cold, but you have to know how to protect your voice. My voice teacher, Horiana Branisteanu, had trained me very well for that contingency. She showed me how to take all unnecessary pressure off of my throat. In fact, I now teach singers and speakers how to protect their voices when they’re slightly ill. So that’s the story of how I got my Japanese name. If you want to know your own Japanese name, check out this website. Sayōnara!